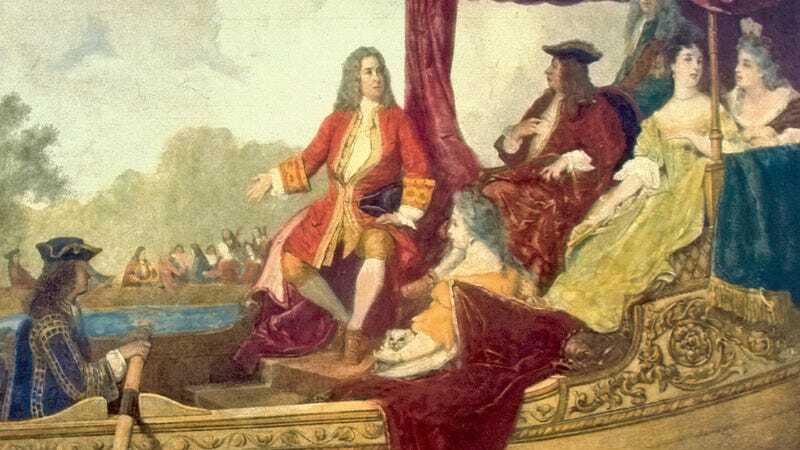 Let me tell you something about Handel’s Water Music, which you’ve likely heard at least in part, even if you don’t know it—probably the posh “Alla Hornpipe” movement from the second suite, the genteel “Air” from the first, or the ball-gown-ready “Rigaudon” from the third. These get used a lot in movies and TV and are part of the canon of badly overplayed Western wedding music. As for the origins of Water Music (or the Water Music, if you want to be a real snoot about it), here’s what we know for sure: On July 17, 1717, the 57-year-old King George I, who had been crowned to the throne of Great Britain despite the fact that he was very far down the line of succession and spoke little to no English, boarded an open barge for a leisure cruise down three miles of the River Thames, accompanied by duchesses, earls, countesses, courtiers, and a floating 50-piece orchestra; said orchestra was led by the 32-year-old George Frederick Handel, a fellow German expat who had been George I’s court composer back in Hanover, when the king was still the prince of the Electorate Of Brunswick-Lüneburg; and the music this Handel guy threw together for that night was probably reworked and repurposed many times afterward. The closest thing we have to a primary source on the barge concert is a paragraph-length article from the July 19, 1717, edition of The Daily Courant, the first daily newspaper in Britain, which misspells Handel’s name as “Hendel.” The earliest surviving score for Water Music dates from the 1730s. There are some legends that surround Water Music—like the one about how Handel wrote the music to regain George I’s favor, having left his duties at Hanover for a career in London years earlier—but these are probably irrelevant. Nowadays, it’s generally performed or recorded as a collection of three suites, with 21 short movements between them, though this isn’t what Handel and his 50-piece band first played back in the summer of 1717. (In fact, my favorite recording of Water Music, conducted in 1993 by Jordi Savall, sequences the movements differently from most versions; in the interest of user-friendliness, all references here are to the most popular sequencing.) The baroque is the earliest period of European music to remain in constant circulation—the home of such chestnuts as Vivaldi’s The Four Seasons and Pachelbel’s Canon In D, not to mention the collected works of J.S. Bach—but the popular image of the perfectionist composer agonizing by candlelight over a years-in-the-making masterpiece is a later invention; it dates to around the cult of Beethoven in the 19th century. Really, the powdered-wig-wearing European composers of the 18th century were more like a cross between jazz composer-bandleaders and prolific Hollywood scorers. They learned to write by improvising over famous themes, made most of their living from live concerts, wrote and rewrote quickly, and freely borrowed from each other’s work. There’s a whole sub-branch of scholarship—pretty interesting stuff, actually—devoted to the borrowing and recycling of the great composers. In some cases, it was brazen, like Bach’s self-plagiarism or Handel’s extensive use of themes from his absurdly prolific contemporary Georg Philipp Telemann, and in others, subtler, like how you can usually figure out which Mozart quartet Beethoven was humming to himself when he wrote this or that. The other thing you should know about baroque music—besides the fact that most of it was written in a rush, to be performed once and then rewritten—is that it sounded raw. In those days, violins and cellos had short fingerboards and gut strings, trumpets didn’t have trumpet valves, and flutes were made out of soft boxwood instead of metal. The parts now played by French horns were written for valve-less glorified post horns called “natural horns,” while the basso continuo parts (basically the rhythm section of a baroque-era band) might include a portable single-manual pipe organ and a 6-foot, 15-string super-lute called a theorbo, both of which were expected to improvise around a bass line. This is a problem that I actually like about baroque music, probably because critics are masochists and want challenges; there is a point where it becomes difficult to separate compositional genius from the genius of history. Like most baroque composers, Handel was foremost a master of arrangement, with a great ear for musical potential; his reuses of Telemann themes are usually better than the originals. Actually, this is true of a lot of great composers of what we’ve come to broadly identify as classical music. Melody might be what people can’t get out of their heads, but the relationship of the instruments is what they experience when they hear an orchestra. And yet Water Music, Handel’s most oversaturated and played-to-death composition, has been mostly arranged by history, tradition, and shifting tastes. I like the first suite’s brassy, wah-wah-ing “Allegro” and pensive “Adagio E Staccato” myself—the more dramatic and energetic movements in this 300-year-old stock library of performed-to-death cues, musical shorthand for an aura of sophistication. But where does Handel end and “Handel” begin? Because we can talk about historical practices all we want, but the fact is that the music we have was probably reused and perfected by Handel according to shifting preferences and needs, and has been rearranged and sequenced several times over. Is everything that lasts a landform, carved and eroded by time in some different purpose and meaning? It’s probably naïve to think that this question only applies to art and entertainment that’s stood the proverbial test of time. Everything exists in some complicated and tense meeting between what was meant and what we want or need it to be.